I love the Spellbinders Card Creator sets! The die cut edges really add a classy and feminine touch to any card. It really gives cards that one-of-a-kind feeling - making the recipient feel very special. The dies are designed to fit 4.25" and 5.5" card widths. The notches on the dies give you perfect placement - no measuring needed. The card below were made with the A2 Bracket Borders One set and the Stylish Stems Framelits from Stampin' Up. You can use a single die to create the layered border. The next card also uses the A2 Bracket Borders One. On this card, I paired two dies together to produce this elegant edge on the white and navy cardstock. The dies fit perfectly together providing different decorative options. This technique works great for monochromatic styles. The layered circle dies are from Stampin' Up. This is a great set - lots of layering options. The third card was made with the A2 Curved Borders set. 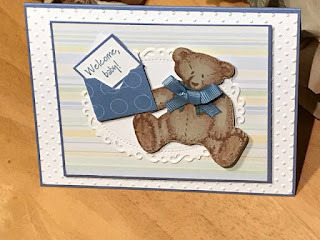 On this card, the die cuts are used as an embellishment instead of on the edge. This card takes a few minutes longer as you need to die cut three pieces of cardstock but the look is worth it. The three layers are attached to a vanilla card - the vanilla shows through the intricate design. The colors used are Elegant Eggplant, Crumb Cake and Mellow Moss with Altanew's Peony Bouquet stamp set. The background was stamped using a set from Inkadinkado. I hope you get a chance to experiment with these dies from Spellbinders. I just love all the ways they can be used to embellish cards.